The relative rarity of this magnificent magic bowl derives from its great age. Its entire surface is etched with Koranic inscriptions in Arabic and talismanic symbols. The interior is etched with dozens of panels and cartouches, each filled with magic symbols and numbers. Talismanic symbols appear on the top of the raised centre. The surface of the rim is etched with Arabic that gives various names of The Prophet and requests for Allah’s blessing. nasta’liq script, followed by another band of script which repeats that which is on the rim. A band of talismanic numbers contained within circles and six-pointed stars (sometimes referred to as Solomon’s seal which has magical associations) follows the prescriptive band. 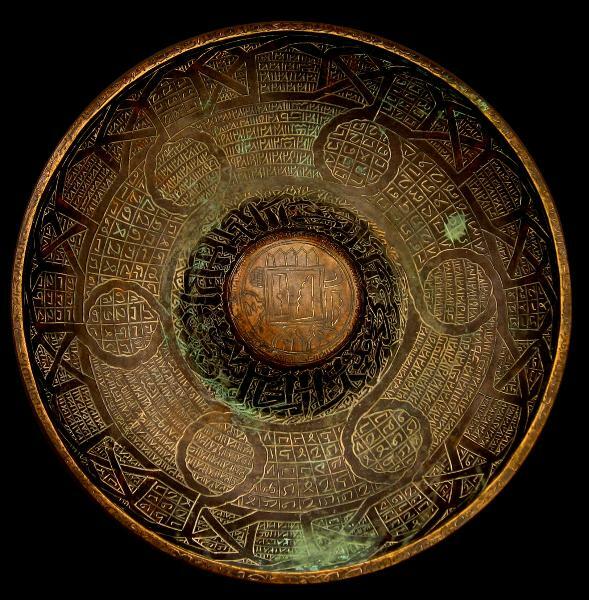 The reverse of the raised centre is filled with more talismanic numbers and symbols and more script in Arabic, around a six-pointed star. The bowl has a beautiful patina consistent with its great age.